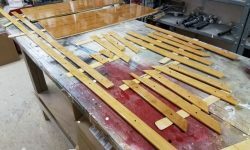 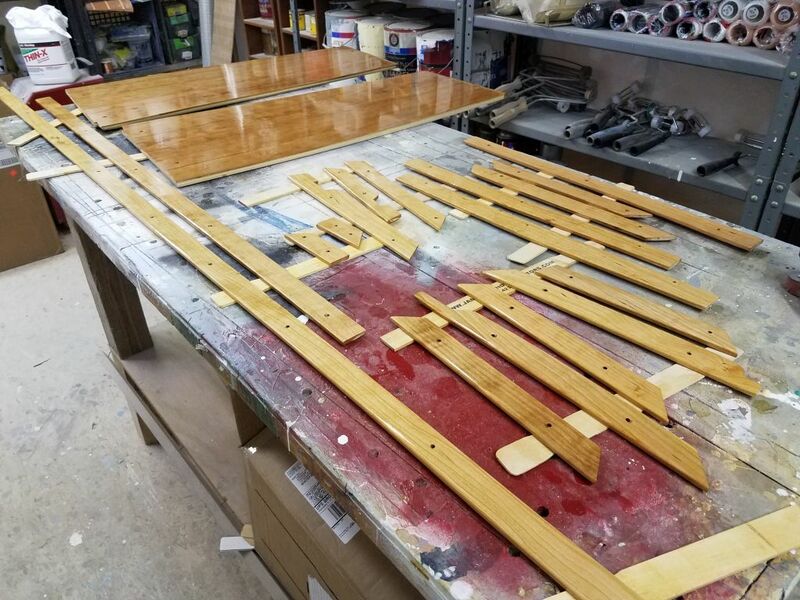 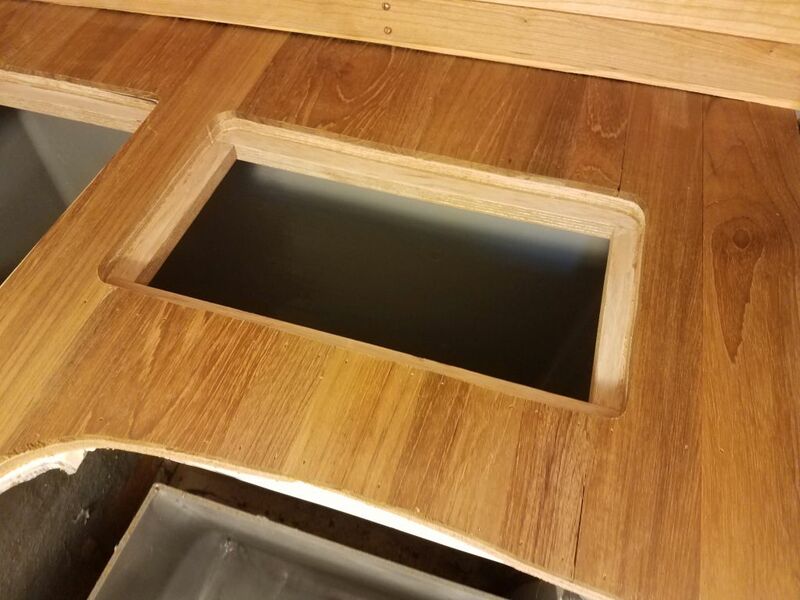 After a light sanding and solvent-wash, I applied another coat of varnish to the various loose trim pieces and the forward hatch area. 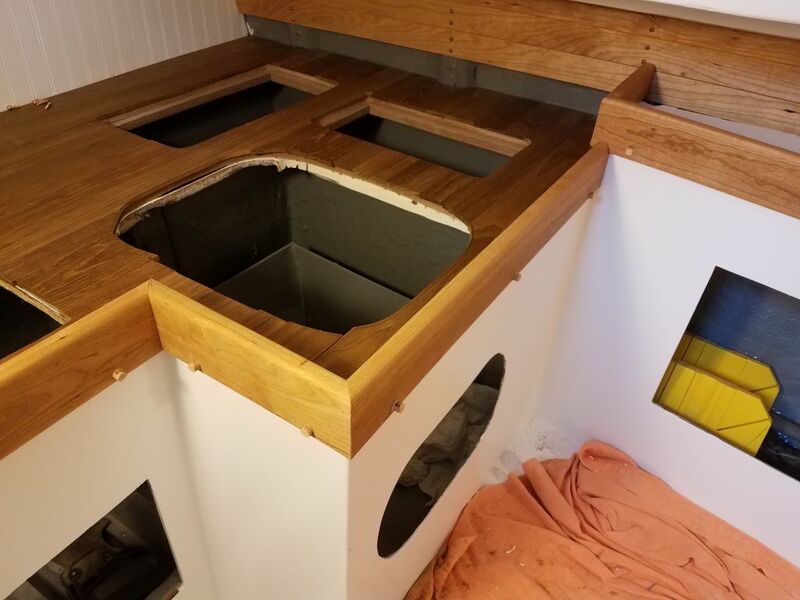 The plywood v-berth filler base was nearly complete, and now I applied its final coat of semi-gloss white paint. 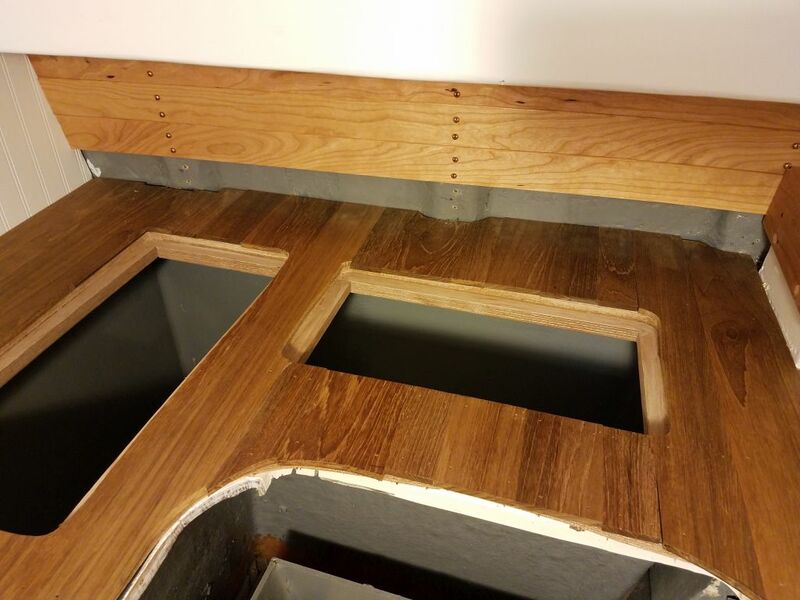 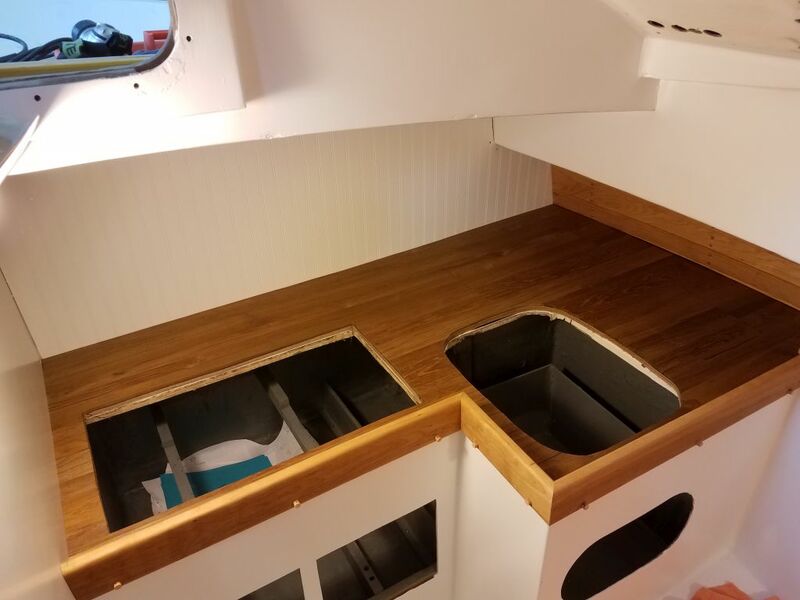 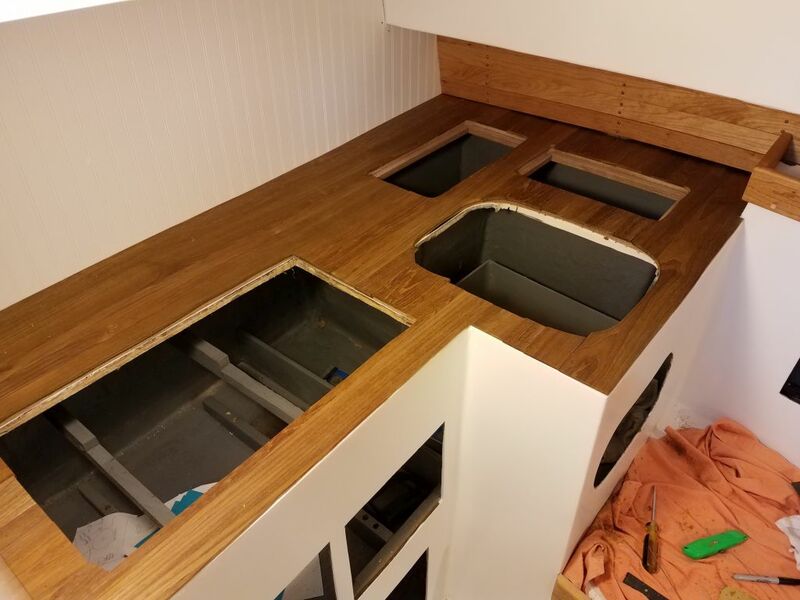 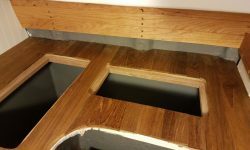 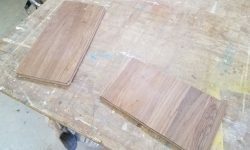 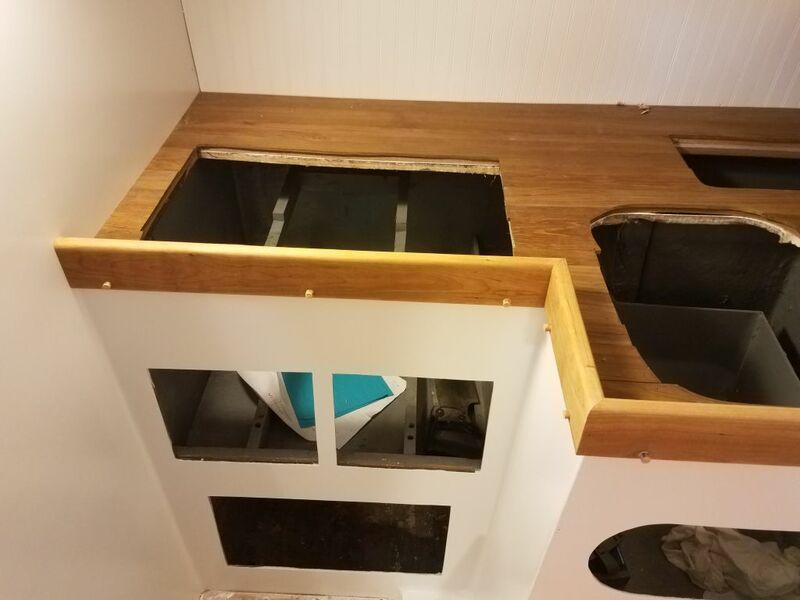 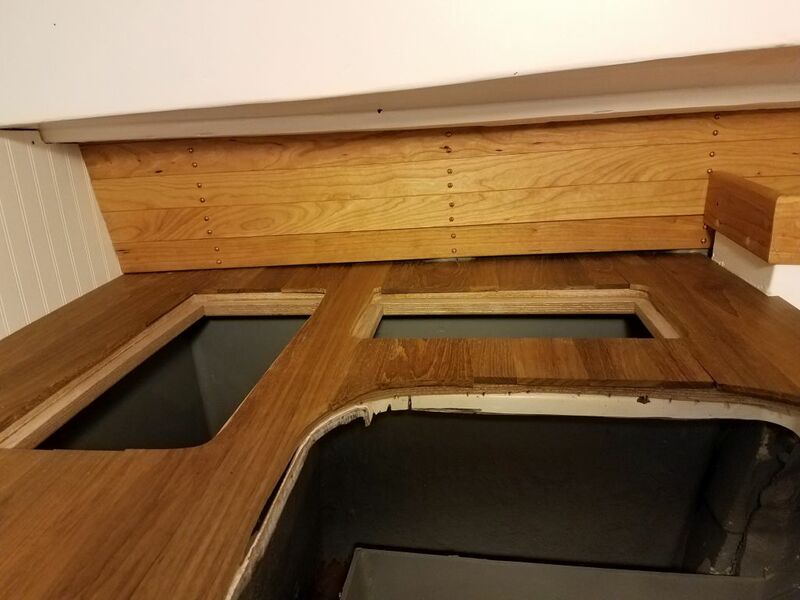 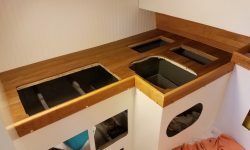 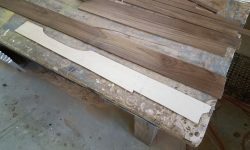 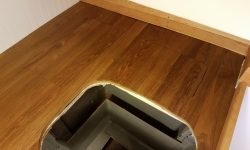 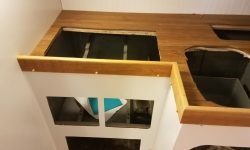 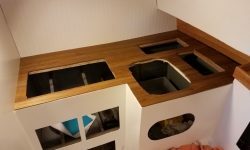 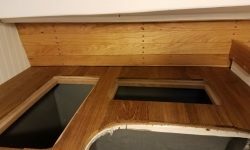 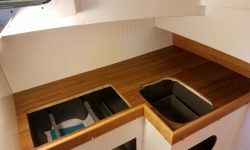 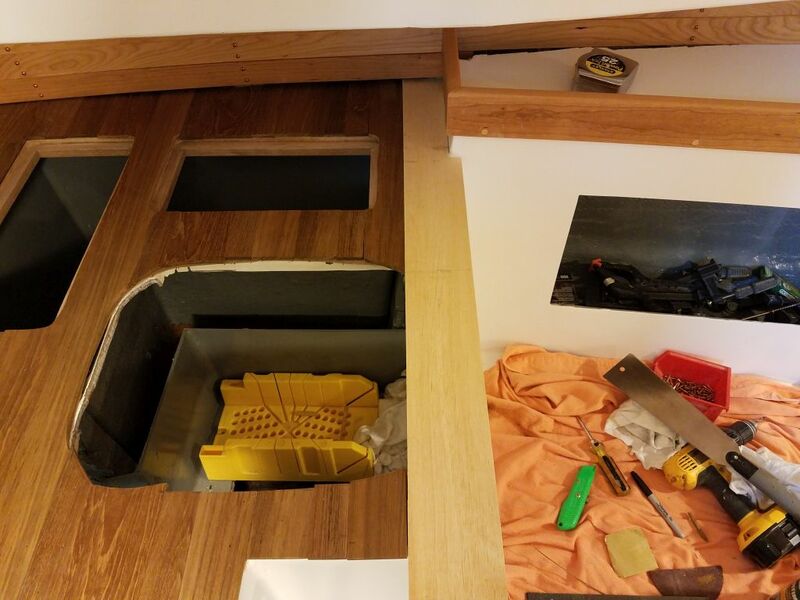 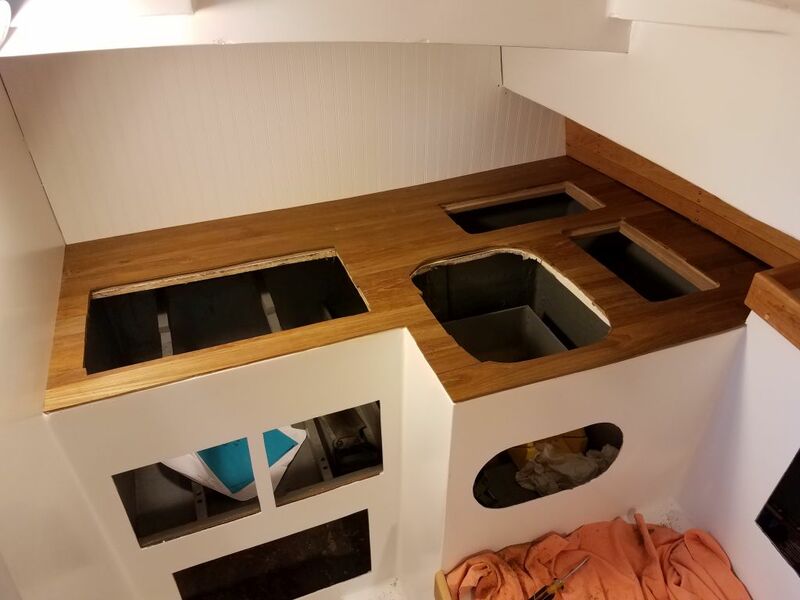 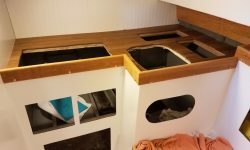 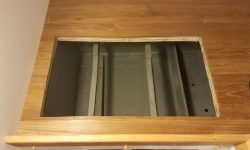 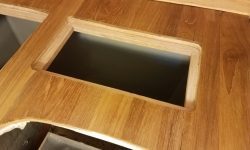 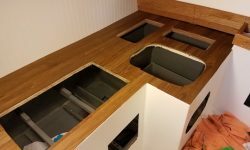 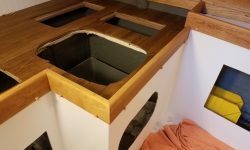 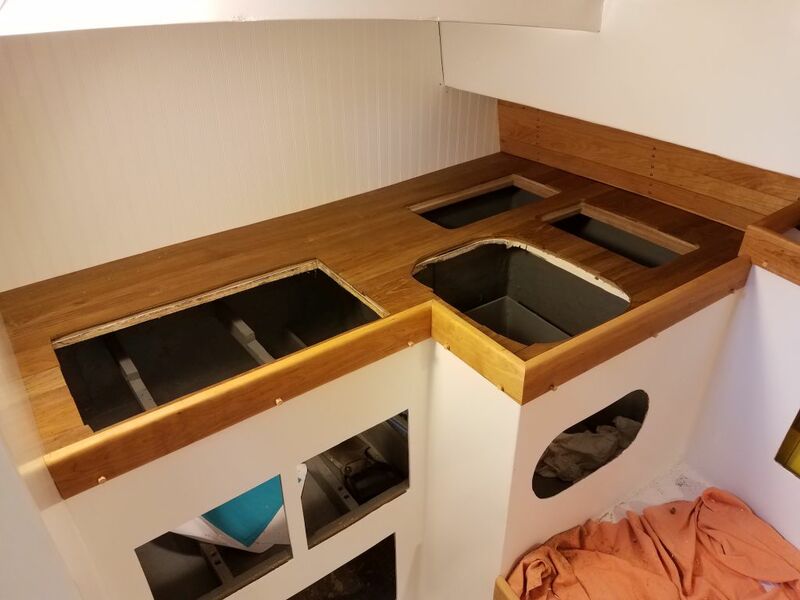 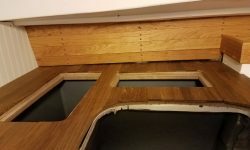 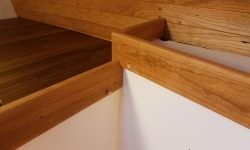 With these smaller tasks out of the way, I worked on completing the teak countertop, cutting and installing the various pieces remaining to fill in the wider section of the countertop. 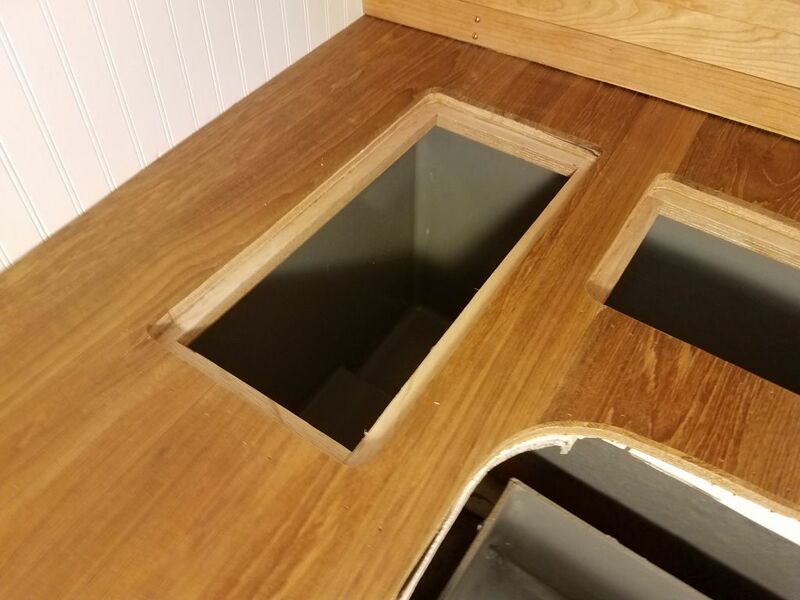 I relieved the back side of the short pieces along the outer edge of the countertop to fit over the slightly-protruding original molding as needed, and when I’d reached the last plank–for which I’d set aside a wide plank for the purpose–I started with a plywood template to figure out the various cuts required at the outboard end, then transferred the shape to the final plank for an easy fitting. 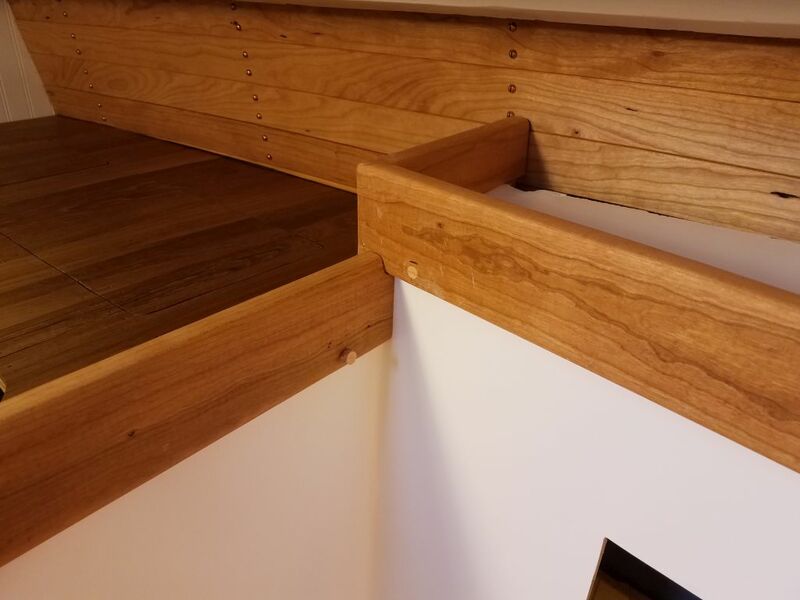 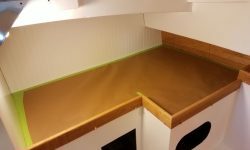 The ceiling at the edge of the countertop was slightly angled, and thus left a wider space at the forward end than at the after end. 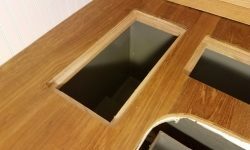 With the countertop now in place, I made some measurements to determine how much additional material was required, then removed the lower ceiling board and, down in the shop, edge-glued another ceiling plank to the lower edge, leaving this assembly in the clamps for a while while I worked on other things. 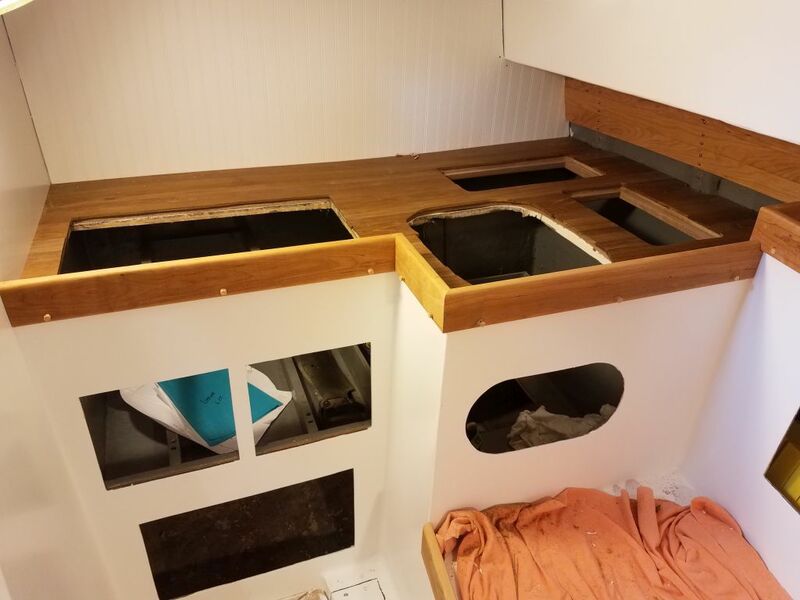 While that was gluing up, I worked on the galley fiddles. 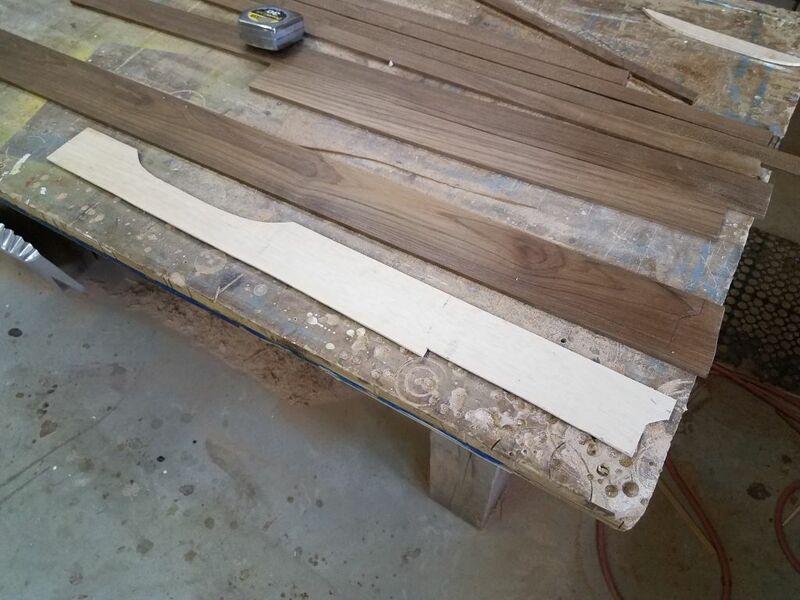 All three pieces of the fiddle had to coordinate exactly with the others for a proper fit, so there was a lot of test-cutting and careful sneaking up on the final lengths and angle cuts, but once there, all three pieces were complete at once. 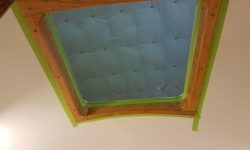 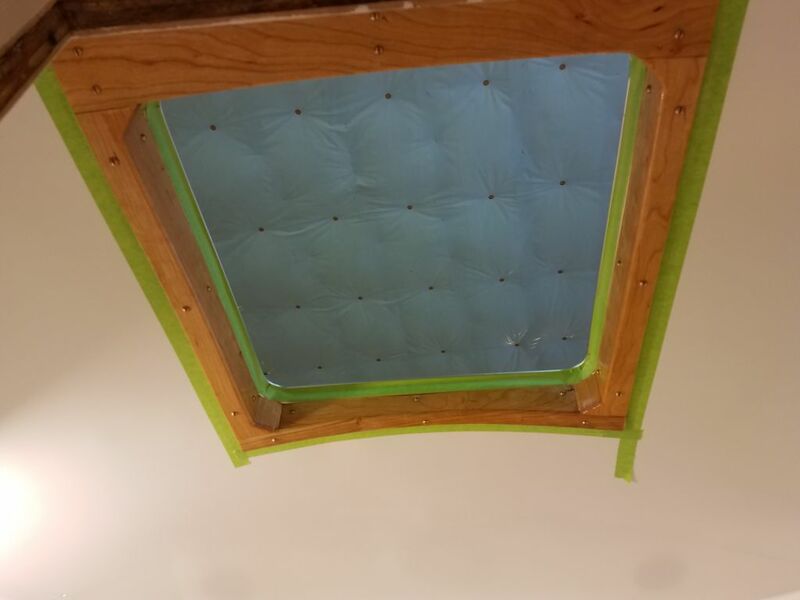 By now, the ceiling glue-up had cured sufficiently for me to mark the new lower piece according to my measurements and cut out the new wedge. 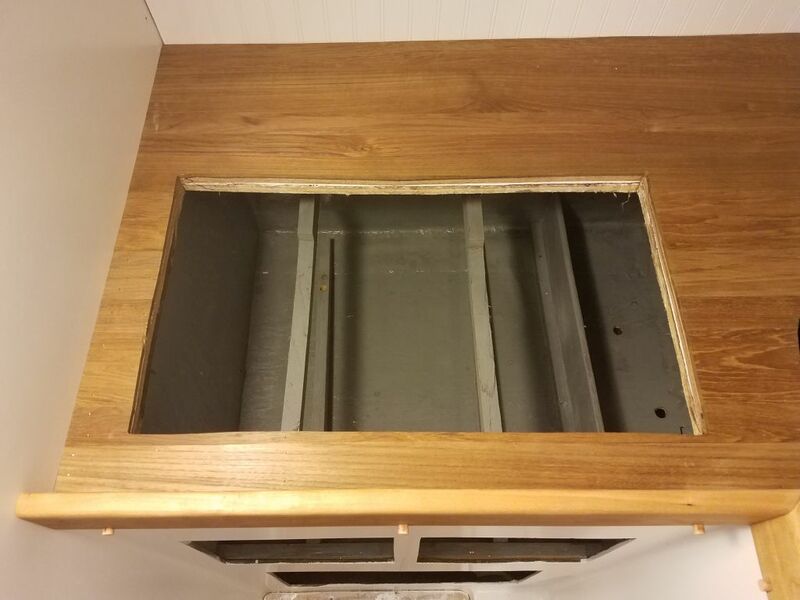 Afterwards, I reinstalled the slightly-expanded piece to complete the ceiling at the countertop. 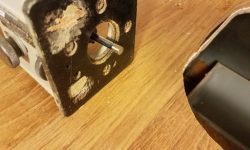 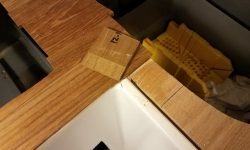 The day’s UPS delivery brought me a router bit I needed to trim the various openings in the countertop. 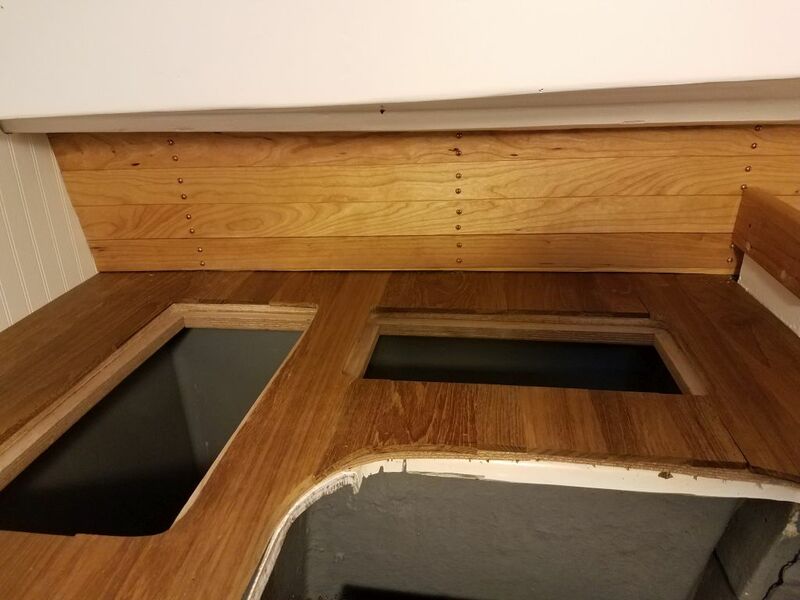 With minimal clearance within the openings, thanks to the support cleats and other factors, normal flush-trim bits, which incorporate a bearing at their lower end, wouldn’t fit here, but I found a small pilot flush-trim bit that used just a solid bearing surface beneath the cutting edge, which required less clearance and would fit in these openings. 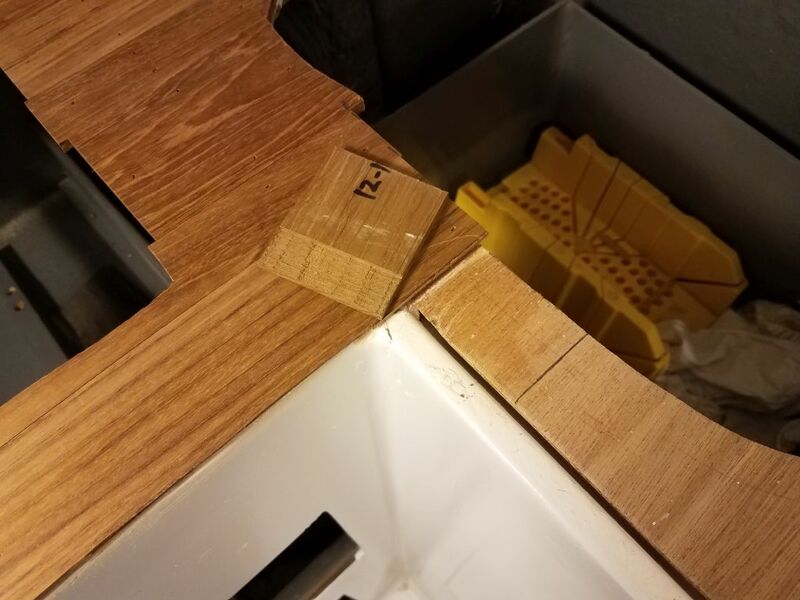 I first had to grind off a pointed cutting edge below the bearing, which was designed to allow the bit to plunge-cut through a solid surface, and this gave me the short clearance I required in order to use a small router to carefully remove the excess countertop from within all four openings, with the router bit following the shapes of the cutouts in the plywood substrate. 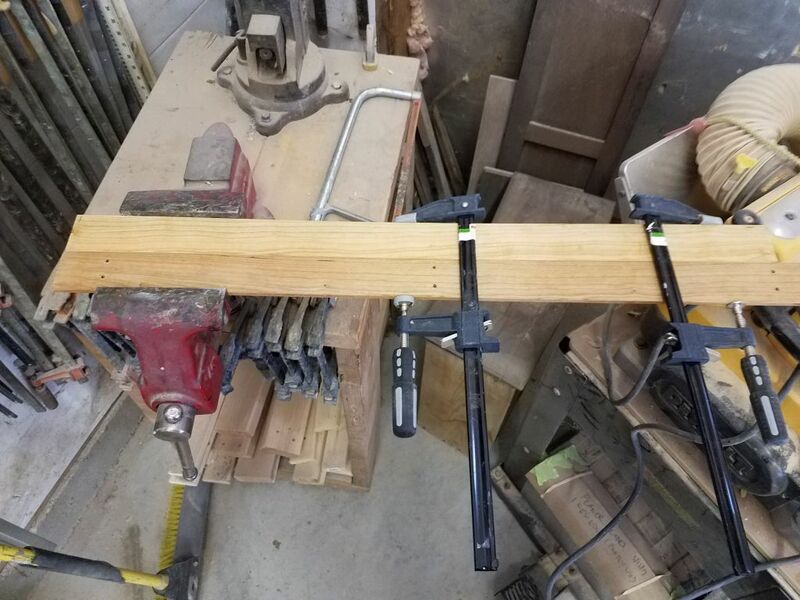 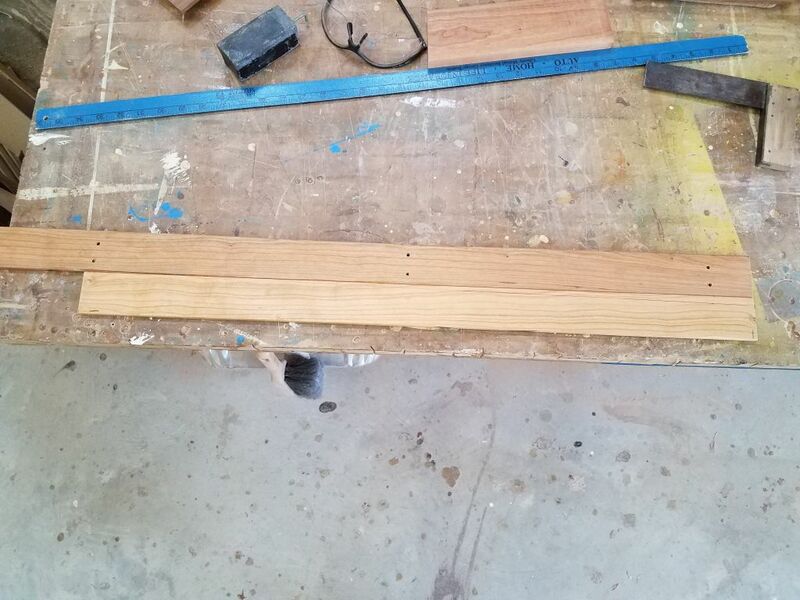 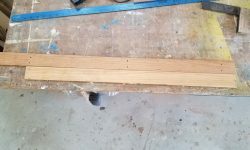 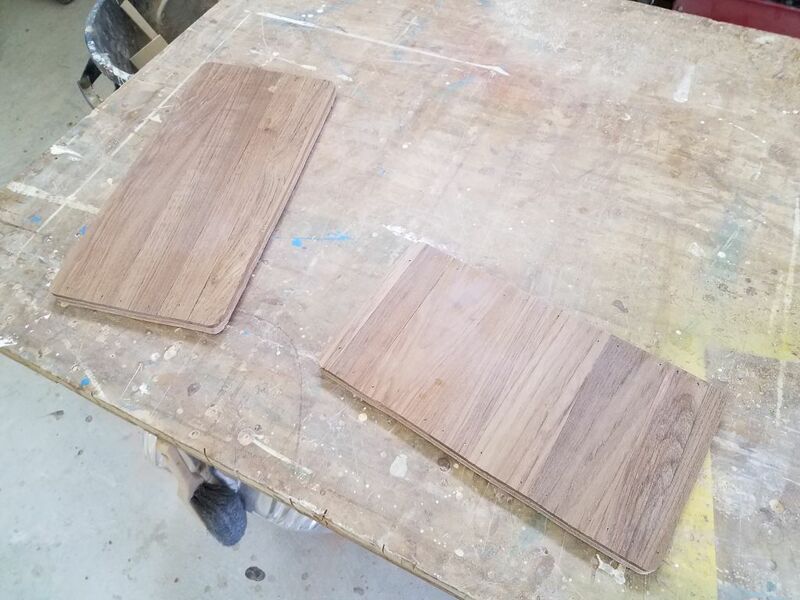 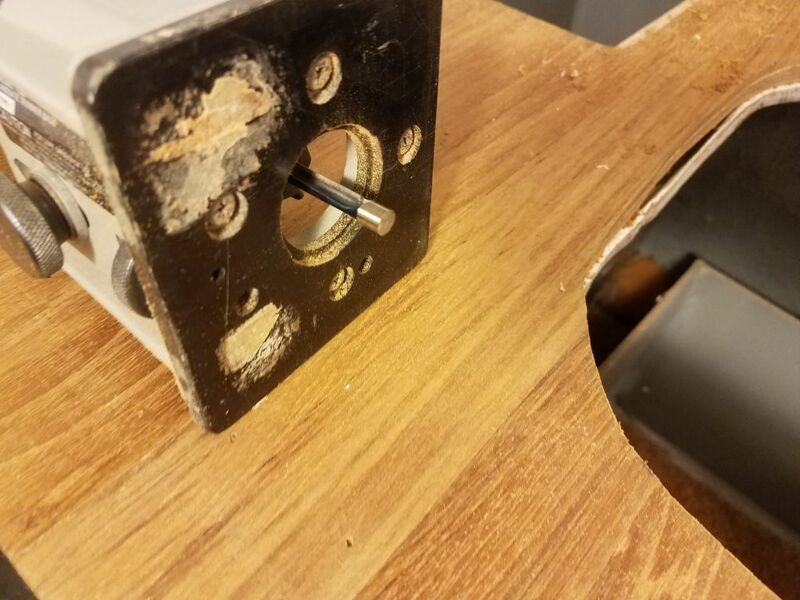 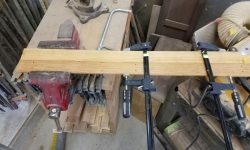 Earlier (no photos), I’d glued up the planks I’d reserved on the two locker lids for the storage area, and now I could trim the excess overlap there as well to complete the lids and the basic countertop construction. 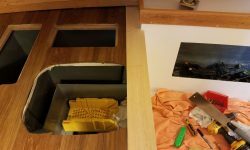 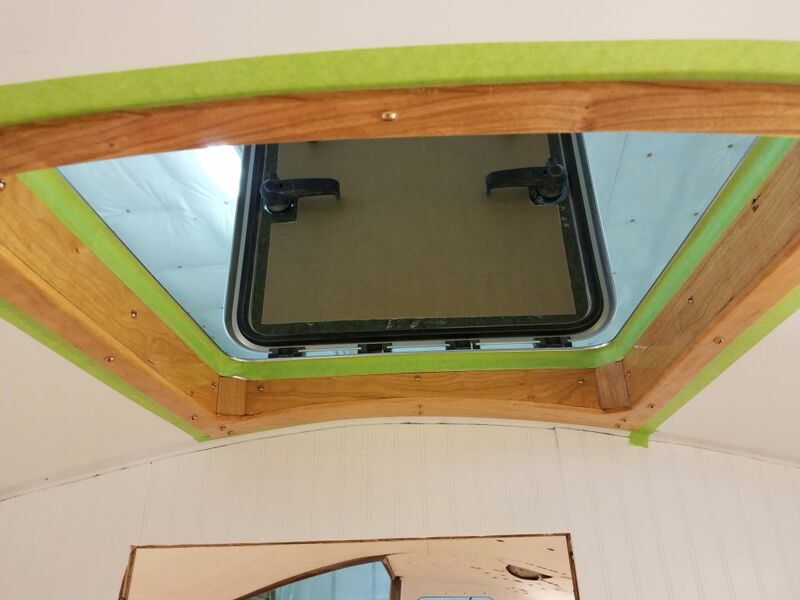 Later, I’d add pulls to lift these hatches for access. 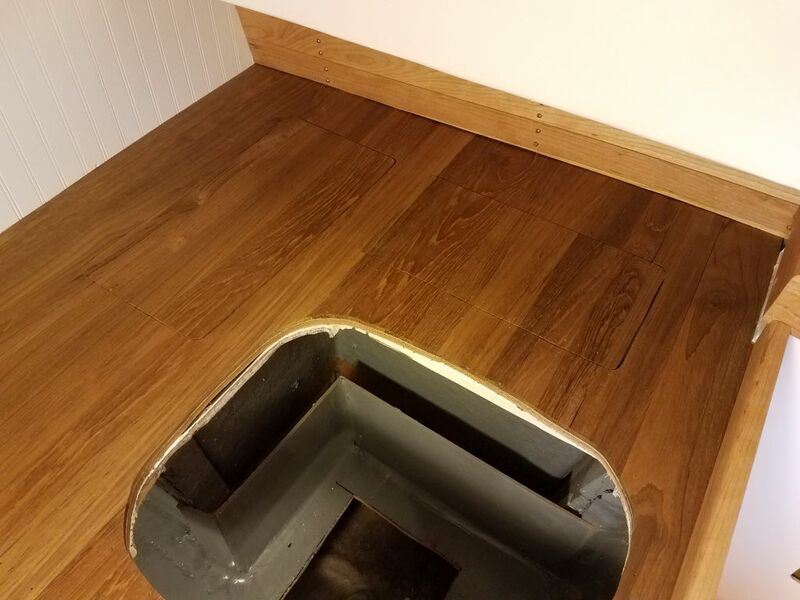 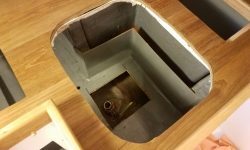 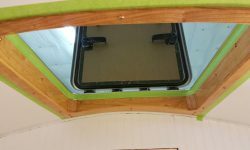 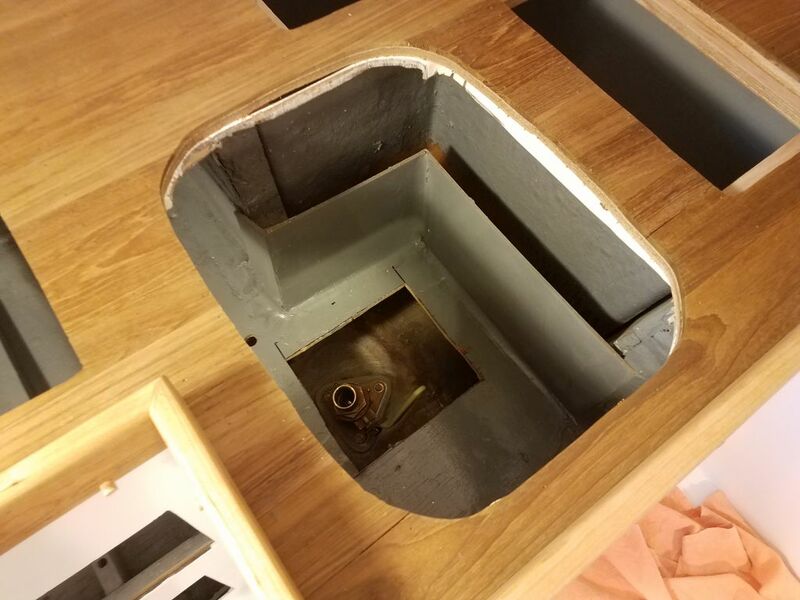 The final surface for the countertop would be a self-leveling bar-top clear epoxy coating, but for these to flow properly the temperature was required to be at least 70°. 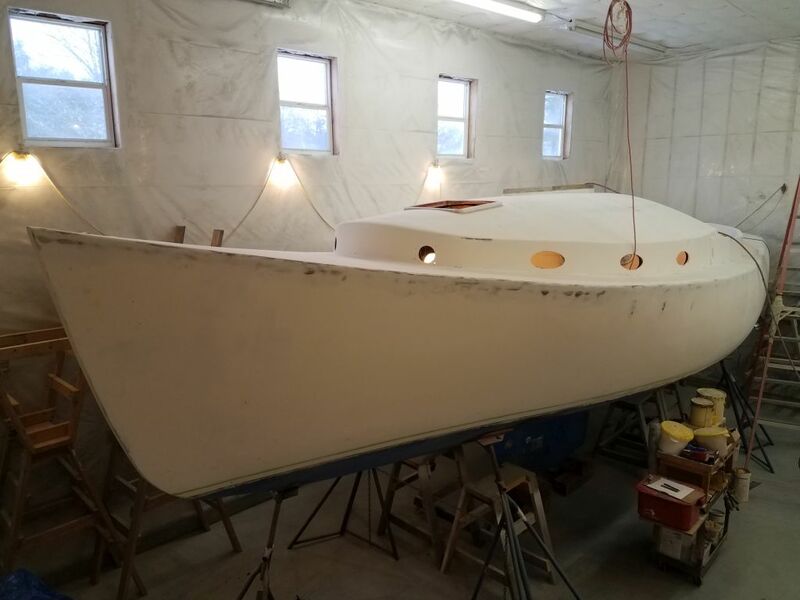 It was fairly impractical to raise the shop to this temperature, so instead I planned to wait till later in the season when the ambient temperature was more appropriate. 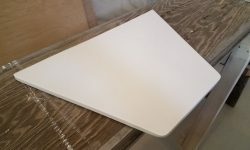 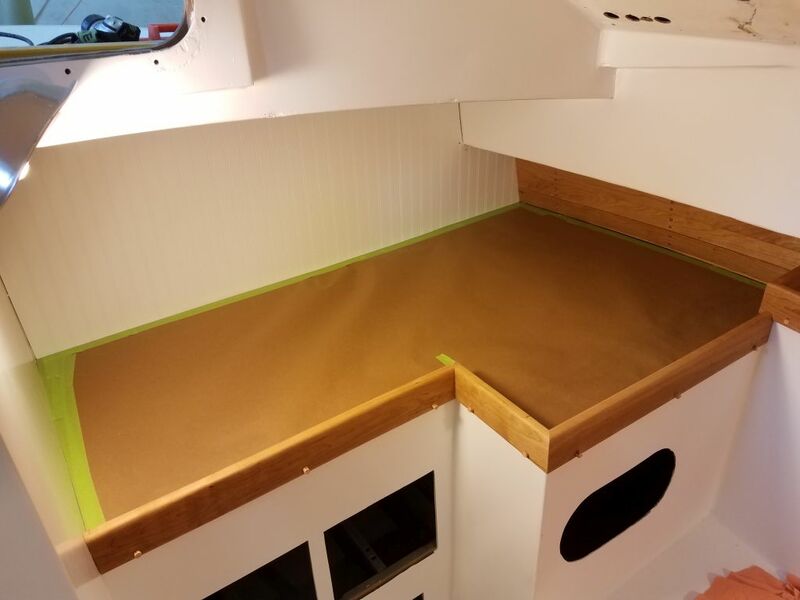 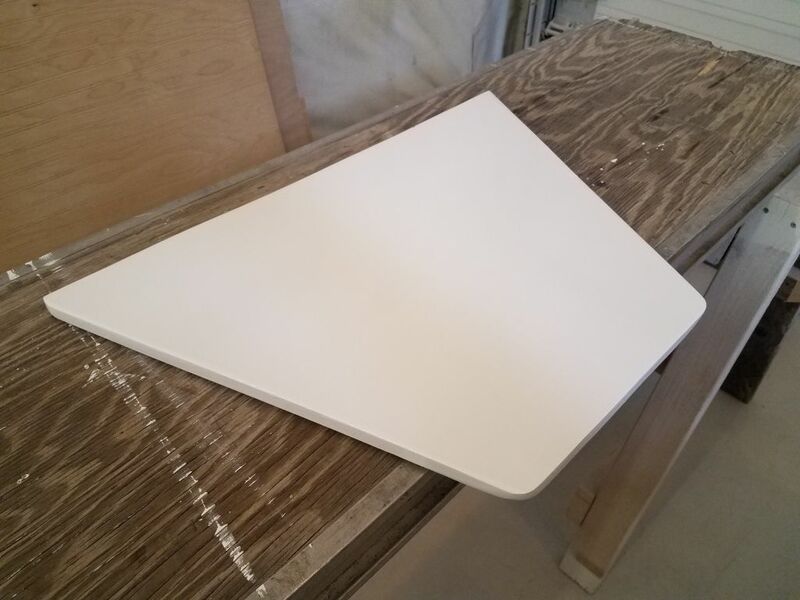 To protect the countertop surface in the meantime, I masked and covered it completely with heavy paper, and I’d probably add a layer of cardboard for additional protection while construction in the rest of the boat continued.